A Raspberry Pi in it’s case with the hood off revealing the PCB. 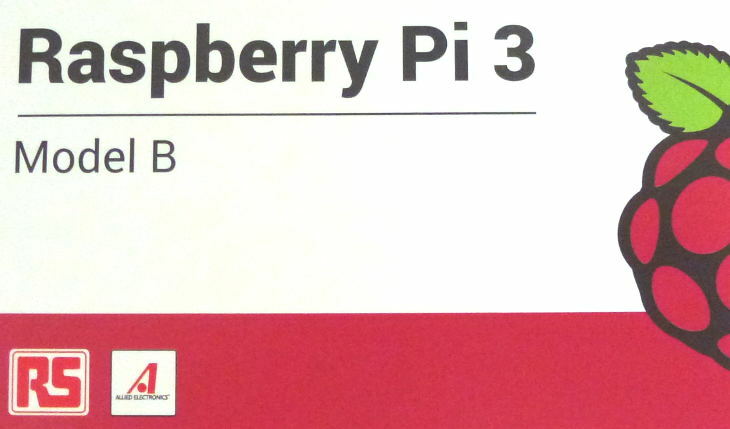 Following on from part 1 of our mission to ‘build’ a Raspberry Pi/Retro Pie based retro gaming machine, here’s part 2. Our bits arrived from ModMyPi well boxed and on time so we can therefore report, based on our limited experience, that ModMyPi seem like a decent bunch. ). This left us thinking maybe we should’ve gone for something a bit more ‘racy’. These fears were quickly forgotten when we got our hands on the standard case we ordered. It looks good, better than in the pictures and consists of five pieces that easily click together to sandwich the Pi circuit board in place without the need for screws. Front view. 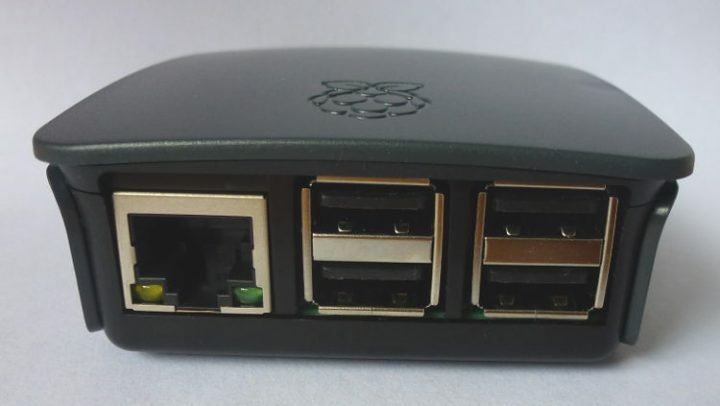 That network connection may not get much use, the Raspberry Pi 3 has built in WiFi. 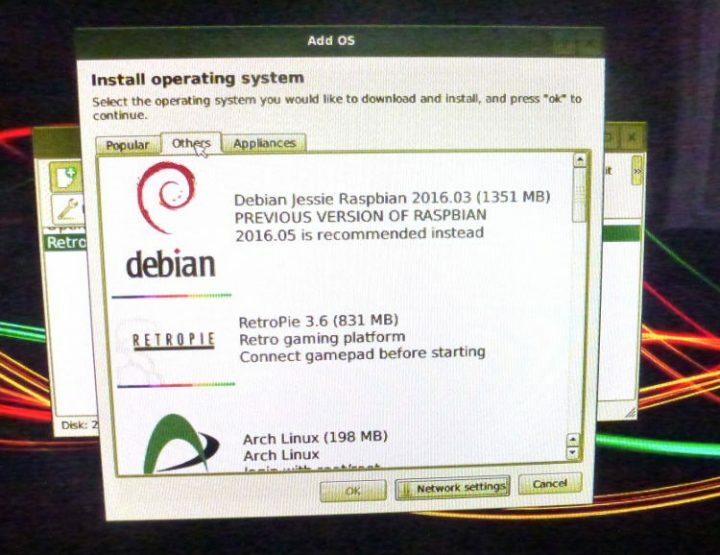 There are a number of ways you can get RetroPie on to your Raspberry Pi, we tried them and found the easiest method for us was BerryBoot. BerryBoot allows you to easily install different operating systems on your Pi and choose which one to boot from when you power up. This is good because we don’t just want to play games on our Pi we’d also like the option to try out other stuff at a later date. To start with there’s a couple of steps to carry out on your normal main computer so you can put the Pi aside for a couple of minutes. First off prepare the SD card your going to use with your Pi by plugging it into your computer’s SD card slot and formatting it. Be warned, this will delete anything currently on the SD card so if there’s anything you want to keep copy it somewhere safe now. To do the formatting find your SD card in File Explorer, right click it and select format. On the window that appears make sure you select Fat32 as the ‘file system’ selection and click ‘start’ to kick off the format. We downloaded the version ‘berryboot-20160313-pi2-pi3.zip’. Once downloaded, locate the BerryBoot file (it should be in zip format) and extract it directly on to your newly formatted SD card. Make sure it’s not in a folder just extract it directly to the root of the SD card. That’s it for your normal computer for now, take the SD card out and plug it into your Raspberry Pi. 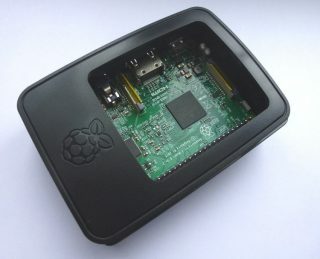 Then plug in your Pi’s power cable, the keyboard and mouse, your game controller and connect the HDMI lead between the Pi and your telly and switch on. Your Raspberry Pi will quickly boot up and show you a window where you need to configure some stuff including locale, some video settings, where you want your OSs to install and also wireless setup. The instructions for this process can be found on the BerryBoot site here. The BerryBoot OS install window. 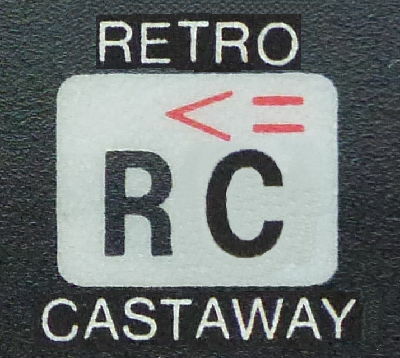 Select RetroPie and install it, this does take a good few minutes so to get in the retro mood you could pretend your waiting for Arcadia to load off cassette. 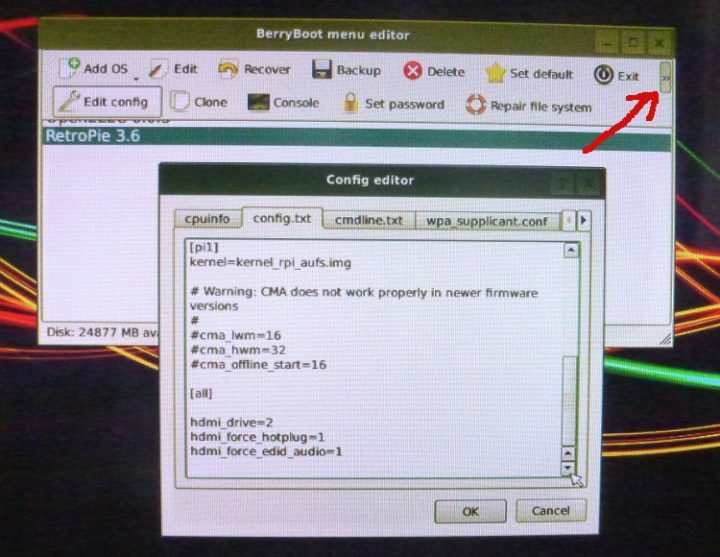 Once installed, reboot and you should see the BerryBoot OS selection menu in which you will see only RetroPie, select it to boot or wait for it to start booting itself. And you should be in. The first thing you need to do is follow the on-screen instructions and configure your game controller, do that and you’re ready to explore RetroPie and try some of the pre-installed games. Things may be different for you but when we fired up RetroPie we found we had no sound. A common problem apparently. To solve this you have to edit the config.txt file…don’t panic it’s easy. Reboot your Pi and when the boot screen appears, click RetroPie so it is selected in the OS selection menu and then click the little box in the top right hand corner with >> in it (we’ve added an arrow in the image below to point it out). Don’t worry what all that jargon in the file does, leave that to the boffins. Copy these three lines above, paste them at the bottom of your config.txt then click OK and reboot. Hopefully that will have solved your sound problems. And no…we don’t know what the hell those lines mean either, but they work. We’re going to have a few games now and see what’s what. We’ll be back to cover other stuff in part 3 such as where to get games and how to get them on to the RetroPie. Until then, cheerio.